In this interview released earlier today, Natalia Veselnitskaya responds to questions regarding her meeting on 9 June 2016 with Donald Trump Jr., Jared Kushner, and then Donald Trump campaign manager Paul Manafort. What follows is a partial nonverbal analysis. Beginning at 0:14, the journalist says, "Here, Donald Trump Jr. is told, that they want to schedule a meeting with him and the Russian government attorney who is flying over from Moscow [pause]. 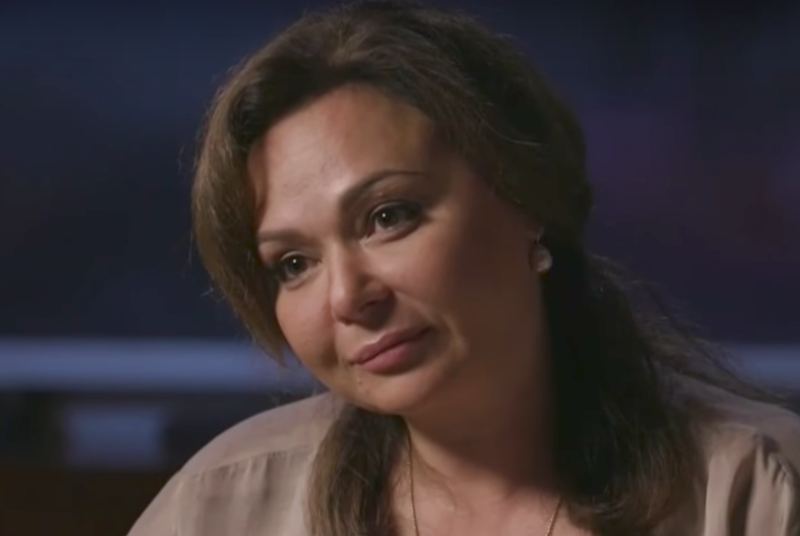 The Russian government attorney..."
During 0:26 - 0:28, as the journalist repeats, "The Russian government attorney", Ms. Veselnitskaya, suppresses a smile, exhales through her nostrils, shakes her head from side-to-side, and blushes (image above). This body language cluster - particularly the suppression of a sincere smile with blushing - is a very strong indicator of guilt. It's nonverbally screaming, "I've been caught!" Please watch this segment several times as the still image does not capture her entire display. Later in the interview, the journalist says, "... they had the impression, it appears, that they were going to be told some information, that you had [microexpression of fear]- about the DNC ..."
During 1:43, just after the journalist says "had" - and during the first syllable of "about", Natalia Veselnitskaya's superficial neck muscle (the Platysma) flexes very briefly - (this is best seen on her right neck) - in what is known as a microexpression. This particular microexpression is that of fear. As with the earlier tell, this is subtle but very revealing and must be viewed in the dynamic context of the video. At first glance, you may confuse this with a swallow ("hard swallow") - but it's not - watch carefully. Colloquially, this nonverbal display is known as, the "Neck of Fear". Summary: Natalia Veselnitskaya's nonverbal behavior in this interview tells us, with a very high degree of confidence, that she acted as an agent of the Russian Government when she met with Donald Trump Jr., Jared Kushner, and Paul Manafort on 9 June 2016. More specifically, she exhibited deception and fear during this interview. Nonverbal Communication Analysis No. 3896: Did Matthew Perry Really Beat Up Canadian Prime Minister Justin Trudeau?